I went to Wesleyan University, where the legend of four-time Boston Marathon champ and Wes alum Bill Rodgers hung heavy over the cross-country team. Inspired by Koichi Morishita and Young-Cho Hwang’s duel at the 1992 Barcelona Olympics I ran my first marathon in 1993, qualifying for Boston ’94 where Bill was kind enough to sign a star-struck 20-year-old me’s bib number at the expo. Three years later I moved to Japan for grad school, and through a long string of coincidences I came across a teenaged kid named Yuki Kawauchi down at my neighborhood track. I never imagined he’d become what he is, but right from the start there was just something different about him. After his 2:08:37 breakthrough at the 2011 Tokyo Marathon he called me up and asked me to help him get into races abroad. He’d finished 3rd on the brutal downhill Sixth Stage at the Hakone Ekiden, and given how he’d run the hills in the last 6 km at Tokyo ’11 I thought he’d do well at Boston or New York. “If Meb can win them there’s no reason you can’t,” I told him. Due to his work schedule Boston was never possible, but New York fell on a long weekend in Japan and he was able to run there three times. Unsuccessful the first two, the night before his third run as we were heading out for dinner Bill came into the hotel lobby and walked straight over to us. “Hi Yuki, I’m Bill,” he said. “I really admire what you’re doing.” Totally ecstatic, as we walked away Kawauchi said to me, “Bill Rodgers! Luck is on my side this time! Tomorrow is going to be a good day.” The next morning he finished a respectable 6th, outkicking the great Meb Keflezighi for his best-ever performance in the World Marathon Majors. During the women’s marathon at the London World Championships Mary Kate and I fleshed out the details for Kawauchi to run Boston in 2018. Having run Boston six times I knew that Kawauchi had to go run on the course in advance, and that meant going at the New Year when he had a week off work for the Japanese public holidays. I also knew he’d want to run a race while there and found a little local marathon in Marshfield just south of Boston on New Year’s Day at the end of the trip. 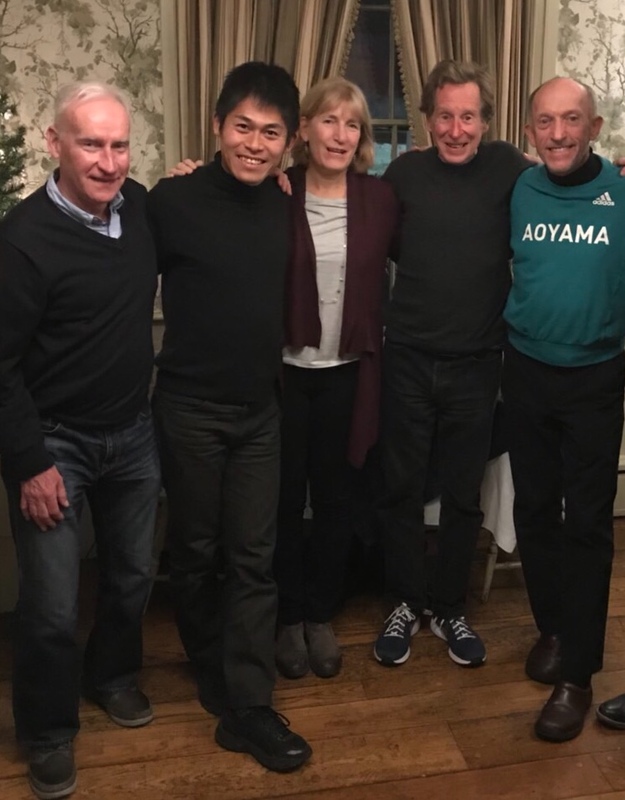 Completely coincidentally, Mary Kate was a member of the club that put it on, so in London I asked her to get it certified as part of Kawauchi’s Boston invite so that he could break the sub-2:20 world record there. Kawauchi’s run at the below-zero Marshfield New Year’s Day Marathon has been covered before. Between that and his win at the hot and humid Wan Jin Shi Marathon March 18 in Taiwan he covered both extremes of the possibilities inherent in Boston weather. At the Hofu Yomiuri Marathon he practiced negative splitting. At Wan Jin Shi he tried out fast-starting frontrunning over rolling hills. 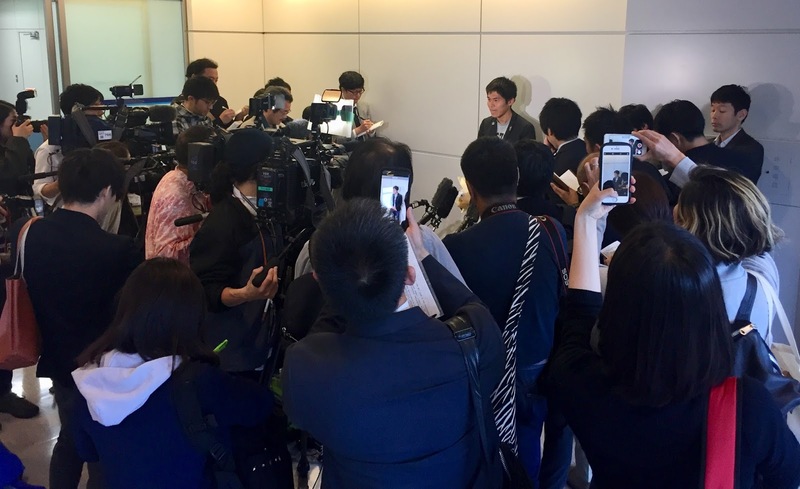 Addressing the course, the weather, different tactics in his preparations, what was left for Kawauchi to face was the most daunting obstacle, the competition. Defending champ and London world champion Geoffrey Kirui. Silver medalist Tamirat Tola. A long list of Africans far faster than he’ll ever run. But above all, one name. Galen Rupp. By using his head. Looking at Rupp’s marathons to date and those of his teammate Suguru Osako, taken all together it became clear that the NOP only had one approach: exert the minimum effort possible until 30~32 km and then just do it. Sit and kick. Sit and kick. Sit and kick. That was all they had, and it seemed pretty clearly telegraphed that Rupp would kick off Heartbreak for the win. If you could just neutralize that last 10 km they had nothing. The only question was how. Race day dawned even worse than we’d expected, and the whole trip out to Hopkinton we sat next to each other without speaking, Kawauchi listening to music and me looking out the window at the light coating of snow on the ground, the waves of rain and driving wind, and two rows ahead to where Rupp and Salazar sat, Rupp with some kind of electric stimulator attached to the nodes behind his ears and Salazar staring straight ahead. In the Korean Presbyterian Church by the start line in Hopkinton the other elites immediately claimed spots around the walls of the gym or scurried off to private rooms upstairs. Kawauchi sat himself down in the center of the gym inside a ring of chairs to prepare himself. I sat on one of the chairs thinking what a trip it was to be there after having been outside looking in six times, and about what to say to Kawauchi before the start. When he went out to warm up I said hi to Meb’s brother and agent Hawi, who I hadn’t seen for a while. “What’s Yuki planning to do today?” Hawi asked. “Run the best race of his life,” I answered. How do you go about beating people who are better than you? Look to Ali and Foreman. Open with something they're not expecting. Take them outside their comfort zones. Get inside their heads. Make them make stupid mistakes. Conventional wisdom said that nobody who goes out hard in Boston wins. Kawauchi has made a career out of testing conventional wisdom. Everyone takes that admonition, that if you go out fast in Boston you can’t win, as a warning. But look at it from another angle. It’s not a warning, it’s a clue. A clue on how to win. If no one who goes out fast can win Boston then if you make everyone else go out fast they can’t win. Anyone who was worried about conventional wisdom, that going out too fast on the Boston course would hurt them later, would feel anxious and lose mental focus, self-doubt growing when they should have been feeling calm and relaxed. Anyone who wasn’t thinking about conventional wisdom would be pounding the fatigue into their legs and burning up energy they’d need later in the cold. Maximizing the competition’s self-inflicted damage early on. Just like Ali and Foreman, Ali whispering in Foreman’s ear, “Come on George, is that all you’ve got? Hit me.” Foreman losing control, hitting Ali with all he had, faster, harder, burning himself up while Ali endured, waited, goaded him on. Phase two of the plan: breaking Rupp. Pre-race Rupp had said, "I train in Oregon, so cold and rain don't worry me," so there was reason to be concerned. “Concentrating only on Rupp was the best approach I could take,” Kawauchi said. “It kept me from getting distracted by all the others.” Over the middle stage of the race through 25 km Kawauchi made a series of surges to keep the pace moving whenever it slowed beyond his liking, refusing to let Rupp and the others rest and conserve energy in the cold. “I couldn’t let them get comfortable,” he said. As expected Rupp stayed in the pack whatever its pace, never seeming to exert himself. But on Kawauchi’s last surge the pack splintered, and among those who couldn’t keep up was Rupp. What was at first a few strides turned into measureable distance, and just like that Rupp was out of sight, then out of the race. Throughout the middle part of the race Kirui and a few others took turns at the front in between Kawauchi's attacks. Kawauchi mostly ignored them, but whenever it was Kirui out front he was right there behind him sheltering from the wind. Over time Kirui seemed to notice, his focus maybe slipping the tiniest bit, a hint of irritation, a hint of distraction. He responded to Kawauchi’s last move with a hard, hard surge into the hills after 25 km, dropping the few remaining from the lead group and rapidly opening a lead. “I couldn’t go with that,” said Kawauchi. “I figured he was probably focused on getting away from Rupp too, but I thought it was too hard too soon so I didn’t worry about it and decided to run with Shadrack Biwott and Abdi Nageeye through the hills.” Nageeye soon dropped, but Kawauchi waited until the peak of Heartbreak Hill to dispose of Biwott, taking advantage of having run the last part of the course three days in a row, his resistance to the cold, and his characteristic closing strength to set off in pursuit of the world champ. Phase three. At 35 km Kirui was up by over a minute and a half, but after making the left turn at Cleveland Circle he hit the wind fully head-on and began to fade even as Kawauchi gained momentum behind him. “I’d been running that part of the course every day so it was really familiar and comfortable,” he said. “All I thought about was finishing with my best running, forward, forward, forward.” Kawauchi never noticed passng Kirui, vaguely aware of a presence on the other side of the road near the Citgo sign but not looking to see if it was a woman or man. Half shocking, half seeming like an historical inevitability, Kawauchi broke the tape to become the first Japanese winner since a month after he was born 31 years ago, the first Japanese winner male or female of a World Marathon Majors race. A dominant performance that capped Osako’s 3rd-place finishes in Boston and Fukuoka last year and Yuta Shitara’s national record in Tokyo to fully baptize the rebirth of Japanese men’s marathoning. The reaction back home was just what you’d expect, with dozens of TV and print journalists from every national network and major newspaper pouncing upon him the second he walked through the doors at Narita. A former national record holder in the marathon texted me to say, "He has made me proud to be Japanese like him." How did it happen? He was lucky that the weather played to his greatest strengths, but Kawauchi came to Boston fully prepared for any situation. He was smart, strong, unafraid. There hasn’t been a marathon where someone so fully controlled everyone else around him since Wanjiru in Beijing ’08. This was the work of a master artist at the height of his powers, crafting a work of lasting beauty in his own recognizable and idiosyncratic idiom. “It felt like the hand of fate,” he told me later. “All through the race I kept remembering what you said. ‘This is the day I was born for.’ I’m so glad I ran Boston.” For me too it felt like the completion of a journey, something that started with Morishita in Barcelona, passed through my life and running, through one of Boston's greatest champions, and somehow came to this. I think all I've really wanted was to see again what I saw in Morishita that day. And at last, there it was. A “historical inevitability” indeed. Or, perhaps concomitantly, the Law of of Large Numbers allowing the strength of the signal to sing above the noise. Wonderfully told and much-appreciated account of a magnum opus. Thank you. Thanks a bunch for this "inside story". I'm not a competitive runner, so did not know how much strategy--chess-like--is involved with the marathon. Hats off to Yuki Kawauchi!! Darn it who is cutting onions in here?! What a story, and what a story. One day, when you publish the best book (or series of books) available on modern Japanese distance running , I would not be surprised, indeed I would hope, to re-read this article verbatim somewhere. It is brilliant that Kawauchi could finally win the Major that he has deserved for so long, and his achievement fully warrants the inside report which you have presented so well. But in addition this article, together with your report on the Comrades from a year or two back, provides a fascinating context to the reader about who the author is and why he writes in the first place. Thanks Brett for this wonderful write up. So happy for Yuki. A wonderful triumph, and an exciting story, narrated in an exciting way. The triumph of humility, the triumph of all of us. Thanks for telling us. My best wishes for the next challenges. I was nearly crying for him at the finish I could see how happy he was he really deserved it well done Kawauchi! Thank you sir, I really appreciate your writing and perspective. Great article, which takes us all through the race and the preparations for the race. This win in Boston is no more than what Kawauchi deserves. Feel so proud of him. Many thanx, Brett!!! Very inspiring! Kawauchi is the true hero of running world. You both did great job and hopefully will keep doing so! Congrats to Yuki and good luck to both of you! Amazing report! Such an inspiring story. Now I want to go out and run. Congratulations Yuki a well deserved result. Congratulations Yuki well done and well deserved. Brett, thanks for taking the time and focus to put into words this amazing experience for both you and Yuki. I agree with many of the other people who submitted comments that this is perhaps one of the most engaging articles that you’ve ever written on the blog, not just because of subject matter but because of style of prose.Once again I took my hat to both of you for bringing the world of Japanese running to the forefront of everyone’s attention and telling the story of the indomitable human spirit! When you went off to the Red Sox game last year never imagined it would lead to this. So incredibly fantastic! Well done to you both. Brett, reading your article gave me goosebumps! Excellent report on a fantastic story. Thank you. Great read. Made my morning. Thank you. Great writing, Brett. Thank you. Wonderful story Brett and great insight. I was watching the television coverage at home and when they finally broke back to the men's race and I spotted Yuki over Kirui's shoulder I knew what was coming. WOW just Wow. Great victory for a very deserving athlete. Athletics needs more Yuki's and Desi's. Yes, I think it's your best article ever, and you've written a lot of good ones. I lived in Saitama Ken for three years and have been reading your blog and following Yuki's progress from your early posts. So happy for Yuki! God ordained it to happen. Another detail worth mentioning was the strong marathon debut by Yuki Kawauchi [...]. Kawauchi was 20th in 2:19:26, but he ran a nearly 5-minute negative split with a first half of 1:12:28 after starting in the back of the field with only a half marathon qualifying time. Kawauchi's splits from 35 km to 40 km and from 40 km to the finish were the fastest in the field, faster than winner Annani's. Brett, thank you & congrats to you and Kawauchi for the historic win. What a perfect storm of weather and good/misfortunes. Kawauchi put his heart and soul into his races & I cannot be happier for him. Great write up about one of the great races in the history of marathoning. I love that Bill was part of this. When he ran the record in '75, tying his shoes on the way, he inspired a (then) young runner to try for the marathon six months later. Those announcers owe him a piano! Fantastic race report. I have been keenly following your coverage of Yuki for years. I could not be happier for him. Thank you for this, Brett. Very good stuff, and well written. Watched the tv feed from our hotel in Boston with a coworker and when we saw Yuki rolling up on a clearly faltering Kirui, we both looked at each other and cheered! I had been eagerly awaiting this story since Yuki broke the tape, knowing it would be such a fantastic write up. It was more than worth the wait. The world's best elites now know how much harder they will have to run to beat Yuki in his element (bad elements). Thank you and Yuki has now, as I read from a comment on letsrun, achieved demigod status. Fantastic article Brett! Massive congratulations to Yuki and yourself, you guys make a great team. Truly a great article. Congratulations. Thanks Yuki for inspiration, thanks Brett for letting us know more about the great story. I was very close from heart attack when reading the end of race comments on twitter. Excellent piece!! Was amazing to watch and amazing to relive here. Very inspiring race in Boston! Thanks for a great blog, Brett! It was so inspiring and insightful! I have never met either you or Yuki... but I hope to remedy that some day soon. I love the great story that Yuki gave to us and feel that it would be a helpful read by almost anyone else who aspires to distance running success. So many lessons to be learned from your blog story. I will post on my facebook page so that many more people can benefit from this. Thank you for this creative effort. Beautifully done and so beneficial to all who take the time to read. Nice article, I loved the insights you shared about Yuki's thoughts as he was runnung. Tried to find both Japanese or other language articles but could not find any other interviews Yuki gave that mentions these. But basically he won because many of the Kenyans dropped out. That was the race I saw unfolding and having listened to Your pieces through Marathon Talk recognised his start was deliberate and designed to unsettle the rest. What a spellbinding performance, what a brilliant description. Has to be the best race I've ever seen good luck to both Yuki and yourself In the future. So inspiring. This backstory is incredible with great perspective. Kawauchi-san really brought about full race tactics. I've felt that marathon racing lately has been more about the final 10K. Kawauchi-san showed that it's important to look at a race as a whole and to be fully engaged throughout. Truly magnificent racing! Please, write a book. You hold tons of motivation in your pen. 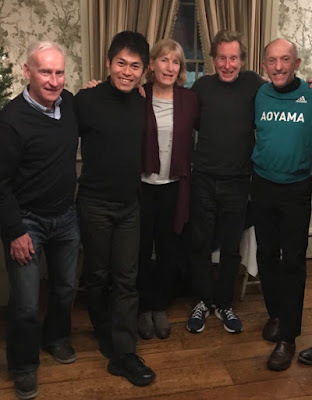 Great article, as usual, Brett, and many thanks for your insights into the often incredible world of Japanese distance running! I was welling up as Yuki came down the the last 400m, yelling to my wife, "He's going to win it!". Amazing win from an amazing man. The elitist part of me wants him to do a "sensible" build up to a big marathon to see how much faster he could run (surely he would?! ), but, what the hell, it's entertaining and he an't doing so badly!! Great article, love your work, and love Yuki's even more ! Fantastic article! I found you through Marathon Talk. Your write up is excellent, thorough and engaging. Thank you. What an awesome article!! I've read it over and over and I got goosebumps every time! I happened to run Boston this year too. I knew Yuki would do great in that horrible weather. I kept asking spectators "who won the race??" (Galen? Shalane? Des? Molly?) and finally a spectator told us as we were running through Newton ("Linden and a Japanese guy!" "Yuki Kawauchi!?" "Yes!!"). We (the runners) all erupted in cheers and you cannot imagine the energy boost we got from that great news! Thank you Yuki for inspiring all of us so much. And thank you, Brett, for bringing Yuki to Boston! Thank you for telling the story...I've been yearning for more details. Please take it to a Hollywood producer. 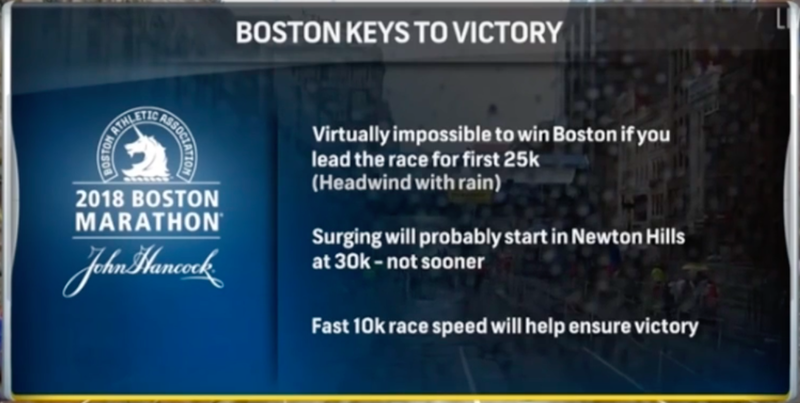 NBC's television coverage of the Boston Marathon was horrible and spent way too much time on the woman's winner plodding through the last few miles. I knew a great men's race was unfolding but we only got to see bits of pieces of it. Congrats to you and Yuki...so inspiring! Thanks for the great article and story. Love to hear about race strategy! Reading several months later, still gives me the chills. Thank you Brett.